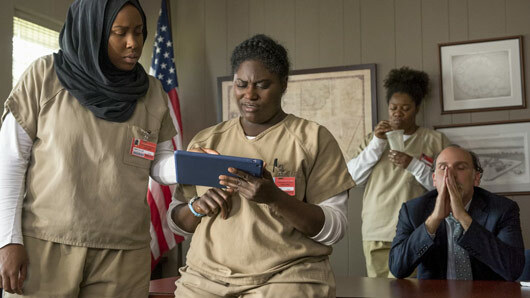 Creator Jenji Kohan has explained why the latest season of Orange Is The New Black fell short in comparison to previous seasons. The Netflix series is dearly loved by many viewers as a show that intelligently tackles issues surrounding race, gender, sexuality and the criminal justice system; and in a way that manages to be thought-provoking, hilariously funny, heart-warming, and heartbreakingly sad all at once. However, the latest instalment didn’t quite meet the calibre of seasons 1, 2, 3 and 4 for some fans, with the drastic change in format disconcerting certain viewers. Season five of OITNB, which consisted of 13 episodes, all took place over the space of 24 hours and, unlike the 93%-and-above ratings given to seasons 1-4 on Rotten Tomatoes, the fifth season only scored 74%. Speaking to The New Yorker, Kohan and executive producer Tara Herrmann admitted the fifth season didn’t quite hit the mark. Hermann explained: “We had lost a bunch of the original writers. It has been reported that only two writers from season five have been rehired to work on season six, so hopefully we can expect a return to greatness next year. Orange Is The New Black seasons 1-5 are available to watch on Netflix.